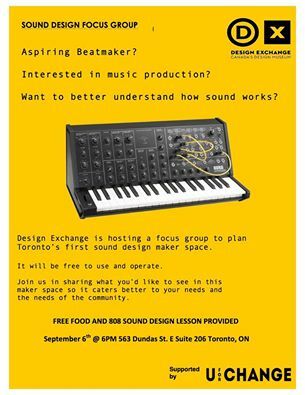 UforChange’s DJ alumni David is hosting a Sound Design Focus Group in partnership with Design Exchange. He is researching what youth are looking for in a series of sound design workshops. This focus group will help him create the syllabus and then teach what youth actually want to learn! If you’re an aspiring beatmaker, interested in sound or just love music, then join the focus group! The focus group will take place on Tuesday September 6th at UforChange. The location is 563 Dundas Street East, Suite 206 from 6-8PM. No need to RSVP. Free food and sound design lesson! For more information, contact: david.ariza@live.com!